An independent production company based in Stockholm, Sweden. Read more here. Citizen Schein has been nominated for 'Best Documentary' at Gothenburg Film Festival. The documentary portrays how the 14-year old Harry Schein arrived in Sweden as an unaccompanied refugee child fleeing the Nazis, but quickly made his way to the top of the Swedish society. He was a big celebrity during the 60's and 70's, best friends with Olof Palme and Ingmar Bergman and married to movie star Ingrid Thulin. Citizen Schein is a story about power, and the price he had to pay. Young Sophie Bell is traveling the world. The Swedish Film Institute has created a blue-ray film box which has been sent out to embassies and consulates all over the world to promote Swedish film, and Young Sophie Bell has been chosen as one of the films. The feature film debut of Amanda Adolfsson is a beautiful coming of age story about the kind of friendship that's larger than life, and what happens when the flame goes out. It features performances from Felice Jankell och Hedda Stiernstedt. Read more on the Young Sophie Bell website! You can watch Young Sophie Bell on Telia, ComHem TIVO, Plejmo, SF Anytime, iTunes, Viaplay, Yousee/TDC/Blockbuster (Denmark) and it's available on DVD. Canine was released on SVT 2 on the 20th of July and is on its way out in the world. The drama is about Karin (Tanja Lorentzon), a woman who is stuck in an abusive relationship with her husband Peter (Bengt Braskered). When the dog Orion arrives everything changes as Karin starts to see things from a different perspective. iPhone App - Released on monday the 24th of August. 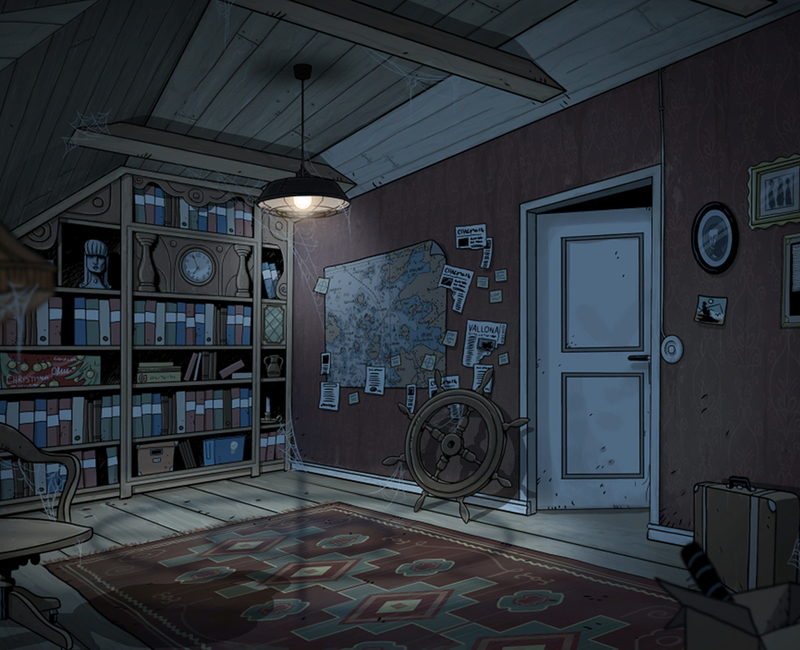 The whispering attic is a reading and gaming experience full of adventure and mystery illustrated by Ola Skogäng. Text by Mats Wänblad, Lena Ollmark and Johanna Koljonen. Breidablick Film has been developing the app experience "Viskande vinden" As a part of their project Krabbsjögrund / Guided by ghosts. Read more about the project on the here. Search for Viskande Vinden or Krabbsjögrund in iTunes and Appstore. After graduation, life begins. At least that's how best friends Sophie (Felice Jankell) and Alice (Hedda Stiernstedt) feel about their new found freedom and move to Berlin. But plans are crushed when Alice disappears. The feature film debut of Amanda Adolfsson is a beutiful coming of age story about the kind of frienship that's larger than life, and what happens when the flame goes out. It features preformances from Iggy Malmborg (Nånting måste gå sönder) och Jella Haase. Watch it NOW on Telia, ComHem TIVO, Plejmo, SF Anytime, Itunes, Viaplay samt Yousee/TDC/Blockbuster (Denmark).